David's 2015 tour of Europe concludes at this historic venue, and this is the third of five shows. The last time David brought his show to this London venue was at the end of May 2006, and film of those three shows ended up as the Remember That Night DVD release. Could he be intending to film one or more of these new shows for future release as well? We certainly hope so! Tickets went on sale Friday, March 6th at 10am UK time, and the DavidGilmourblog.co.uk presale started Wednesday, March 4th for those quick off the mark. For the main sale of tickets, you can use these links: Ticketmaster, Eventim, Seetickets, Stargreen and RoyalAlbertHall.com although please be aware that demand is incredibly high so you might need to be patient and keep retrying, as they seem to be adding tickets for sale progressively. 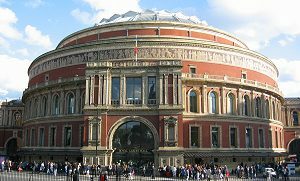 The organisers have pointed out that "for the London concerts, the name of the lead booker will be printed on each ticket. The lead booker must attend the concert and photo ID will be required to gain entry to the venue. There will be no exceptions to this rule. This is to try and stop secondary selling by ticket touts at high prices." This is exactly what happened with the Kate Bush concerts in London last year, and it seemed to work really well. It ensured that fans were there, and ticket touts/scalpers didn't get much of an opportunity to make a killing buying tickets for a show they would have no intention of seeing! We also understand that there are a limited number of VIP packages available for this venue, priced around £249. Again, this is subject to fees and conditions. FIRST HALF: 5am, Rattle That Lock, Faces Of Stone, Wish You Were Here, A Boat Lies Waiting, The Blue, Money, Us And Them, In Any Tongue, High Hopes. SECOND HALF: Astronomy Domine, Shine On You Crazy Diamond, Fat Old Sun, On An Island, The Girl In The Yellow Dress, Today, Sorrow, Run Like Hell ENCORE: Time / Breathe (reprise), Comfortably Numb. 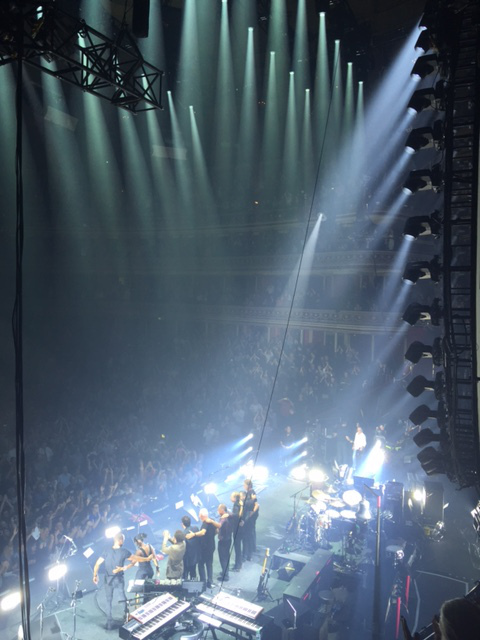 In effect, this is the middle show of David's London run, and immediately apparent was just how well the band are gelling on this tour. The show this evening was arguably the best of the three so far, and potentially one of the best shows of the tour to date. The song selection was unchanged, although it looked like there was the possibility that Coming Back To Life could have made a return to the set. However, at the appropriate time David could be seen speaking to the various musicians and singers, and it looked like he had made a decision changing the set. One particular high spot was the guest appearance by David's son, Gabriel, who recreated his piano work on In Any Tongue - and did a great job. His father then followed up with a blistering solo at the end of this fan favourite. Having said that, solo after solo were stunning tonight. David, and the band, seem right at the top of their game at the moment, so it is a small pity that they are now taking a little break. Let's hope they restart in fine style! The tour resumes next Friday at the same venue. However, let's not look forward quite yet - did you go to this show, the third of the five nights in London? We'd love to know what you thought about it - how was the concert for you? Let us know what YOU thought! 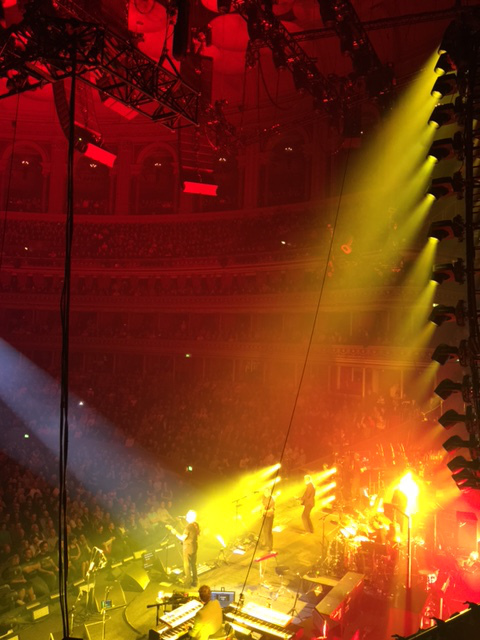 The third night of a five night run of gigs at The Royal Albert Hall and, although the set list still remains unchanged, there is such a difference over the previous night's gig (again). This show has to be the loudest so far, but not to the detriment of the almost flawless sound quality, and the band exude confidence in spades which might be the result of knowing that Rattle That Lock has entered the album charts at number one. Tonight's performance is also much punchier than previous shows and it's quite noticeable how much the new songs are sounding so great now. 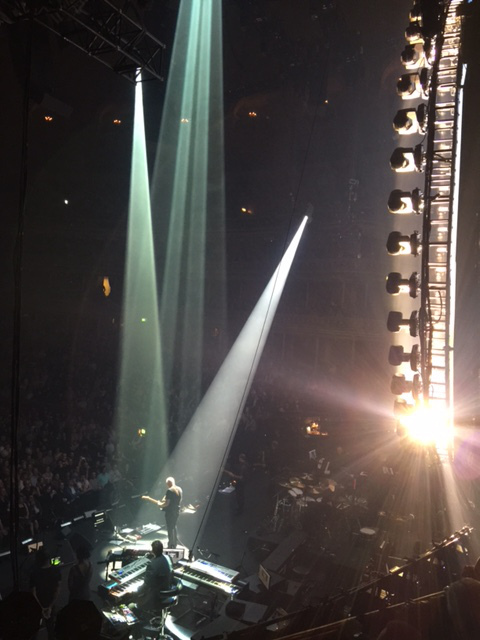 Slowly becoming fan favourites, the new songs have matured nicely in the set since the beginning of the tour in Brighton and dovetail well with David's back catalogue, both solo and Floyd. Apart from the volume, one or two other observations of tonight's show… A surprise guest appearance by David's son, Gabriel, who confidently recreates his piano work on the superb In Any Tongue which is rapidly becoming one of the highlights of the first set. What has to be the 'jazziest' outing so far of The Girl in The Yellow Dress. This song was so jazzy I thought for a moment we'd decamped to Ronnie Scott's in Soho. Nice. I would like to add that I do hope David eventually plays the whole of Rattle That Lock from beginning to end in future shows as I think it works really well as one continuous piece and it would also mean we'd get to hear the slow burning instrumental Beauty and closing track And Then. Fingers crossed! After seeing five shows of this tour it's becoming clear to me that David is now very comfortable with his new position of solo artist and not just 'The Voice and Guitar of Pink Floyd', which I suppose is a tag fans and the media will never drop. Although I find Rattle That Lock not quite as satisfying as On An Island I still love his new music and am over the moon that David has not lost his magic touch having produced an album full of musical gems. Maybe, now that his past is well and truly behind him, this huge talent will grow in confidence and mature further, utilising a lot more of his assured individual talent and personality and finally leaving behind the once suffocating legacy that was Pink Floyd. Phew! 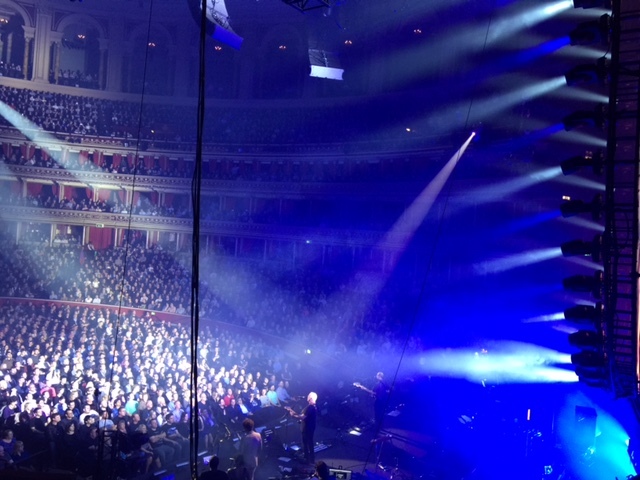 There is now a short break until David returns to the RAH stage next Friday and Saturday night, which I am very much looking forward to attending. This tour is proving to be a firm favourite for me and regardless of whether the set list changes or not, I am just so pleased to be able to hear this guitar maestro performing some of the best gigs, ever, of his long career. I was one of the lucky few to get one of the additional tickets for the show, seated behind the stage in the choir seats. Though you couldn't see the projections on the screen the view of David and the band was excellent and gave a totally different view of the show to those facing the stage. Such an enjoyable night... was in seats literally overlooking backstage first half which was great visually, Phil Taylor setting up the guitars etc., but sound bit muffled. Second half close to front stage left... fantastic views of Mr Screen and guitar work! So many highlights... Sorrow was one, sound so crisp. Great audience reaction storming stage from RLH onwards. Re-listening back to last nights audio he does fluff the first CN solo slightly but no matter... the second solo more than compensates! The tour programme is terrific value... great content and information over 36 pages. No changes to set list, no guests. This tour perhaps being shorter seems to have more energy than the OAI dates for me. The three gigs have been wonderful, as you know. Rattle That Lock, album and gigs, is a musical dream - superb music, and some excellent lyrics too. 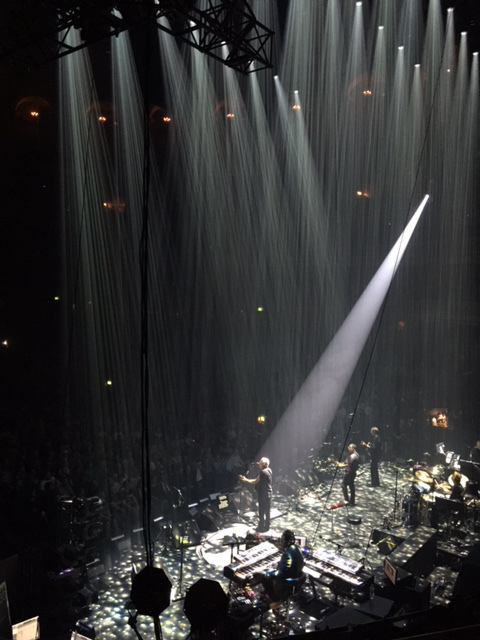 The set must have pleased everyone, with the mixture of Gilmour and Floyd, old and new, rocking and tranquil. The pleasure and enthusiasm of the audience seemed to increase each night, and the band appeared to enjoy it more each time. 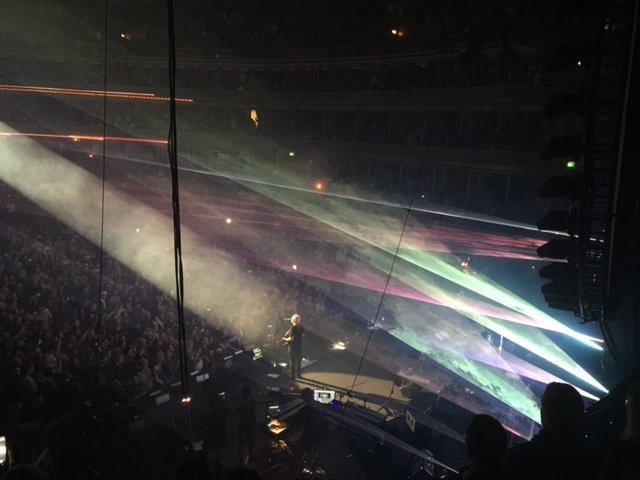 David Gilmour certainly has a lot more music in him, so here's hoping for more fantastic times ahead.